As it is customary during Black Friday season, we began a breakdown of the various Black Friday Circular Ads. This is happening at the Main blog (bookmark this if interested). It is a long post that will be updated multiple times until we cover as many stores as possible. Bookmark that post for brick and mortar circular ad coverage! This blog will continue to post deals as they go live. The Main Blog now focuses more on Reference/Research/Long(er)-Form type of posts, so it’s a good place for the detailed BF Ads breakdowns. UPDATE (6:14pm ET): just finished going through the Best Buy Black Friday Ad. UPDATE (Tue 4am ET): The Free Messenger bag is the offer in this case. The price remains the same at $600 for the Olympus E-M5 body only with Messenger Bag kit. No further discounts. This was part of the Camera and Photo Deals Upcoming deals box, but is not in the Gold Box deals box, so this perhaps explains why it isn’t a daily deal? This limited time offer ended with 86% claimed… Also part of today’s Amazon lightning deals is the Sigma EF-610 DG SUPER Electronic Flash on sale for $180 with free shipping in the Nikon SLR mount. The other mounts are not on sale. This offer ends by 10:50pm ET or earlier if it sells out. This limited time offer ended… The Rokinon CV24M-C 24mm T1.5 Cine Wide Angle Lens for Canon with De-Clicked Aperture and Follow Focus Compatibility is a lightning deal at Amazon, ending by 9:50pm eastern (or earlier if sold out) going for $525 with free shipping. Only the Canon version is on sale. This is only a heads up of yet another twist in the way Black Friday deals are offered. Apparently Amazon.com is trying a new experiment, you can pre-order (!) some of the Black Friday Deals. You will pay the lower price. This experiment is done with these four Samsung HDTVs. This is the first time I see this. I don’t know if other items will be offered in this fashion… So here’s a concrete example, using this 55″ Samsung HDTV as the Guinea pig: it sells for $850 if you want it right now. Or you can “pre-order” it for Black Friday for $800 and it will ship after 11/23/14. The Olympus USA store (GetOlympus) has launched what they call their early Black Friday sale. In addition to the discounts, they also offer free 2-day shipping with any order of $25 or more, which may be useful if you need any accessories or extra batteries and things of that nature. Their sale includes M43 cameras, M43 lenses, and P&S digital cameras. Promotion ends 11/30/14 or earlier if sold out. Just in time for the holidays, the Nikon DSLR Instant Savings have been updated at B&H Photo, you can add as many lenses as you like and the savings will keep adding up. This is a one-DSLR and multiple-lenses purchased together in the same shopping cart promotion. Here is an example, a direct link to the Nikon D750 page over there. All those lenses scrolling down are eligible for this promotion. This limited time offer expired… As part of the Amazon Lightning Deals, starting on Sunday at 9am ET (for Prime members) and 9:30am ET (for Everybody else) there is going to be a sale on Sandisk Extreme 60MB/sec SDHC memory cards. I don’t know if it is going to be just the 32GB version that will be on sale or the whole line-up (16, 32, 64GB). We’ll know for certain when it goes live. This is a limited time offer, as all Amazon Lightning Deals are. To the land of the eBay Deals we return, where we find the new condition Wacom Bamboo Capture Pen Tablet, model CTH470 offered for $69 with free shipping, by BuyDig’s eBay store. Some of the first wave Fuji X100T retailers sold out, but there is a new wave of retailers that have it in-stock! I just updated the Fuji X100T stock status page with the latest details. As usual, there is a “Latest Updated” timestamp. The page is manually updated, so the further away you are from the timestamp, the higher the chances that things may change. This was an older post… This is a heads-up! Four printed photography magazine specials, for $5 per year per magazine will go live tonight at the date-change time period (12:01am Eastern Time on Saturday). A new blog-post will go live at that time. No auto-renewals! You can use them for yourself or gift subscriptions for other photo-people. Details on Sat at 12:01am ET. The promotion will be good for Saturday and Sunday. 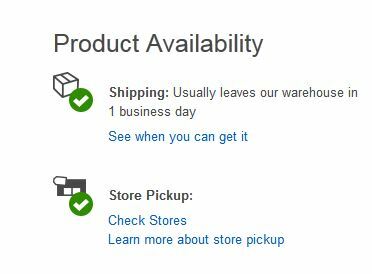 This limited time offer expired… According to the schedule at the Amazon Gold Box, starting at 9:30am ET (Eastern Time) on Saturday 11/15/14, there is going to be a sale on the Sigma EF-610 DG ST Electronic Flash. The sale price will be revealed when it goes live. The price before the sale is $135. If you are part of the Olympus e-mailing list, they just sent an email with a survey. Participating who take the survey will receive a coupon for 5% off their next order at the Olympus USA store. This is a limited time offer, surveys are typically limited in slots available. The offer ends by the end of day on 11/14/14. If you participate and receive the coupon, the coupon expires at the end of day on 12/31/14. You must be in their emailing list and have received an email with the survey promotion in order to do this. Corel is offering their AfterShot 2 software as a digital download for $20. Please note this is the “AfterShot 2”, not the more advanced “AfterShot Pro 2”. You will find a PDF file on the aforelinked page that compares the features of the two versions in detail. The AfterShot 2 is only available on Windows. Pro is available on Windows, Mac, and Linux. The Walgreens website is offering 8×10 Enlargement prints for 99c when you enter coupon code 99CENT8X10 at online checkout. The coupon offer expires at the end of day on Saturday 11/15/14. Options include mailing or same-day pick-up at a local participating store. Check the Walgreens Photo page for more. This limited time offer expired… Groupon Goods is running a limited time coupon promotion. Use coupon code SALE to get 10% off a single Groupon Goods item (this is where most cameras and electronics are), or 20% off a Local item. The coupon expires 3am ET on Friday 11/14/14. Limit one item per customer. Maximum discount is $50 (eg a purchase price of $500). Due to time constraints I cannot price-check Groupon offerings right now, but you can check their Groupon Goods page for ideas (Camera and Photo has its own sub-category on the left side of the page). The Fuji X100T is arriving before our eyes! We just updated the Fuji X100T Stock Status page and the silver version of the camera is in-stock and shipping for $1300 at Best Buy… As usual with new releases, there may be some initial bumps… Please note I can’t stay all night updating the page, so for the latest updates, you can do DIY-checks using the links in the Fuji X100T Stock Status page. If you are a fan of superzoom Micro Four Thirds lenses, the stabilized Panasonic 14-140mm f3.5-5.6 POWER OIS, in the black color scheme, is currently on sale for $560 with free shipping at B&H Photo and Amazon (look for Amazon herself as the actual seller or other well-known authorized sellers). The B&H Specials also include a couple of hard disk storage options! For $92 with free shipping, and a limit of five per customer is the 3TB Western Digital External USB3/USB2 HDD, model WDBWLG0030HBK-NESN. Needs reformatting for Mac usage. This is a limited time/quantity promotion. On the slimmer and more fashionable front, the WD 1TB My Passport Air Portable Hard Disc Drive, model WDBWDG0010BAL-NESN, with a free carrying case included automatically by B&H, is on sale for $91 with free expedited shipping. Limit five per customer. Needs reformatting for Windows usage. This is a limited time/quantity promotion. More B&H action, of the superzoom kind, this is a LiIon-powered camera, the Canon SX510 HS (HS = CMOS sensor) is offered for $200 with free expedited shipping at B&H Photo. This is a limited time offer. Lighting power users, this is for you! For a limited time, B&H Photo is offering the Profoto AcuteB2 600Ws AirS LiFe Power Pack with a free Profoto AcuteB 600 Watt/Second Lamphead (included automatically by B&H) for $1500 with free expedited shipping! This is a limited time and limited supply offer! We continue looking at the B&H Photo Holiday specials (first wave) where we find the Vanguard Auctus 323AT Aluminum Tripod for $150 with free shipping. Offer ends by 11/15/14. No rebates/coupons needed! If you are a “Droneographer”, a brand new DJI model has just been announced! It is the DJI Inspire 1 Quadcopter with 4K Camera and 3-Axis Gimbal, and it is available for pre-order for $2900 at B&H Photo where you can find a detailed product description and product specs. The release estimate is December 1st in 2014. Also coming up (prices to be posted later on) are two other bundles, the two transmitter bundle and a stand-alone transmitter. UPDATE #1: they are now also available for pre-order at Adorama. UPDATE #2: one of the three kits is now available for pre-order at Amazon as well. Also part of the first wave of the B&H Photo Holiday specials is the new condition Sony HDR-AS15 HD Action Camcorder with Wifi offered for $100 with free shipping. Offer ends by 11/15/14. The Olympus XZ2 (black color scheme) compact with RAW is now on sale for $300 with free shipping at Amazon by Amazon herself and B&H Photo and NewEgg… Thanks to one of our readers for the email alert! For a limited time, B&H Photo is offering this Canon G1X plus Underwater Housing bundle for $550 with free shipping together! You get both, no coupon, no rebate, just checkout! The underwater housing is Canon WP-DC44 Waterproof Case. This promotion ends by 11/15/14 or earlier if they sell out… This is the headliner deal of the first round of the B&H Photo Holiday specials (a total of 33 offers listed there). At the bottom of the pile of the Best Buy Daily Deals for Wednesday 11/12/14 there is a Fuji S4830 superzoom bundle offered for $120 with free shipping. It is the camera kit plus a Fuji camera case and a Fuji 8GB memory card. This limited time offer ended… As part of Amazon Gold Box Lightning Deals, ending by 9:50pm eastern on Wednesday 11/12/14 is a lightning deal on the X-Rite CMUNPH ColorMunki for $360 after a $50 mail-in rebate. The price before the sale was $460 ($410 after MIR). Speaking of Amazon, but not part of the lightning deals, this 23-inch Dell E2314H Computer Monitor goes for $120 with free S&H. If you are looking for an excuse to avoid annoying, drunk or pestering relatives/friends/commitments/obligations on Thanksgiving Night, Best Buy has a lifeboat for you 😉 They will be opening at 5pm local time on Thanksgiving night until 1am local time. They will reopen on Friday at 8am local time for more conventional madness. Hours may vary slightly by region/state/store. More at their doorbusters page. The white Samsung WB350F Wifi Superzoom digital camera (conventional digital camera, not Galaxy Android) is currently on sale for $140 with a free Lowepro case and 8GB microSDHC card at Best Buy. Please note this camera takes microSD cards, not full size SD cards… It is also going for $140 at Amazon (limit 2) but no freebies there. You can fight the software sprawl and megapixel wars with SSD! B&H Photo, for a limited time only, is offering this 512GB Toshiba Q Internal SSD (solid state drive) for $200 with free shipping. Limit 10 per customer during this sale. This is model HDTS251XZSTA, SATA 3.0. November is often too late for most new product announcements, but there’s always new stuff that sneaks out, even during Photokina years. Case in point, just announced is the Canon EF 100-400mm f4.5-5.6L IS II USM Lens available for pre-order for $2200 at B&H Photo (and lens hood) and Adorama. More eBay Deal action, this time we have a refurbished camera, it is the Sony RX100 Mark II (second generation or second of her name), offered for $400 with free shipping, with a limit of 10 per buyer, by Secondipity’s eBay store. They also include a 32GB card and case. The warranty is offered by Asset Recovery Division, LLC (“LSI”), a subsidiary of Liquidity Services, Inc. (see PDF file).